The SPS Museum Srinagar was established in 1898 AD in the Maharaja’s Summer guest house largely based on collections transferred from State Toshkhana. Approximately 79,595 artifacts and objects covering various subjects like Archaeology, Numismatics, Decorative Art, Arms and Armory, Paintings, Textiles etc are housed in the Museum. The proposal for the Museum was made around 1889 when a memorandum was submitted to the then Maharaja of Jammu and Kashmir, Maharaja Pratap Singh by his younger brother General Amar Singh and a European scholar, Captain S H Godferry proposing to build a museum in Srinagar for exhibiting artifacts covering the regions of Jammu, Kashmir, Ladakh, Baltistan and Gilgit. However the Museum was finally opened to public in March 1898. The Museum was set up in a smaller Palace of the Maharaja by the banks of the Jehlum where the Guests of the Maharaja used to put up. The Old Museum Building in itself is a work of art with great frescoes and art adorning the walls and the ceilings. This Building faced the brunt of the floods in 2014 and is now closed for Public viewing. The Museum exhibits however have been moved to a new Museum building which has come up. The Museum has on display a number of Terracotta Tiles which were discovered at the remains of an almost 2000 year old Buddhist Monastery in Harwan. This important Buddhist site is said to be the venue of the Fourth Buddhist Council convened by the Kushan Emperor Kanishka in the first century AD. It was from this Council that an estimated 500 monks left for Central Asia, Tibet and China to propagate the message of Lord Buddha. The Tiles show a distinct Parthian/ late Sasanian influence underlying the close connections that Kashmir had with the Gandhara region at the time when Buddhism was the prevalent system of belief in both the regions. The Museum has a number of these Tiles showing daily activities of life in those times. One of the oldest Manuscripts ever found in India, this Manuscript was found is a Village in Gilgit and was then passed onto the Maharaja of Jammu and Kashmir. As for the significance of the Gilgit manuscripts, especially of the Lotus Sutra which was found among the Manuscripts, I quote from a BBC article on the same “The Lotus Sutra was found in Gilgit region, now in Pakistan.The document, which dates back to 5th century, is perhaps the only Buddhist manuscript discovered in India. Believed to be one of the most revered Buddhist scriptures, it represents the discourse delivered by Buddha towards the end of his life. A part of the collection is also housed in the National Archives in Delhi as well as some part exists in the Karachi Museum. 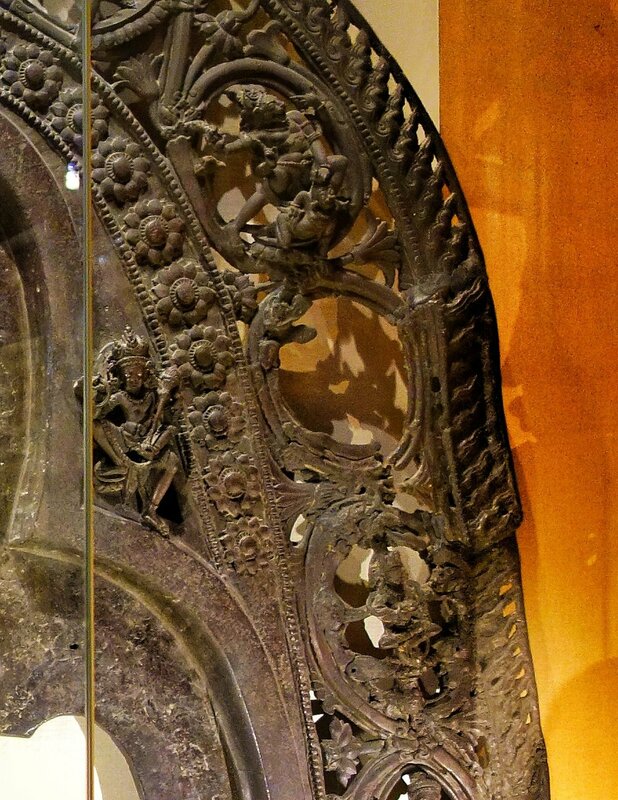 A Bronze frame from the 8th Century of the Vaishnava Avatar. 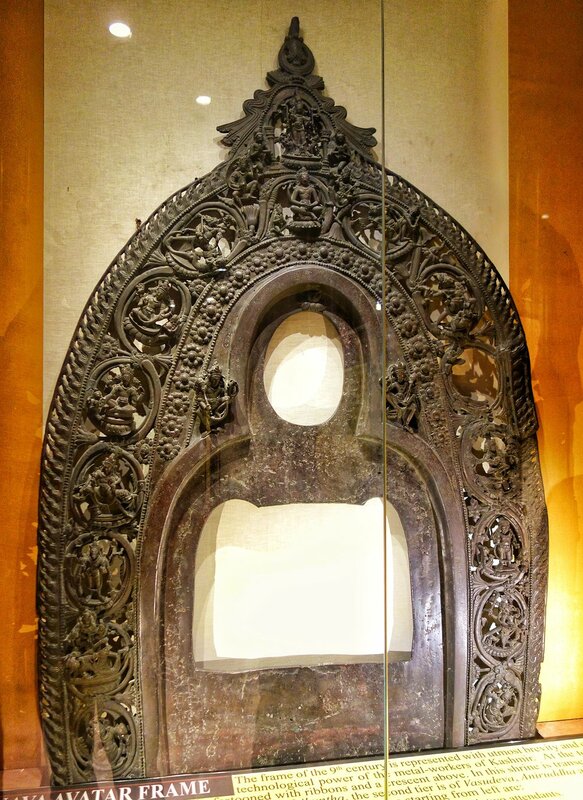 One of the most priceless treasures on display at the SPS Museum at Srinagar is a 9th Century metal “Vaishnava Avatar” frame which is a Prabhavali of bronze metal alloy measuring 6’4″ in height and 4′ wide and 1’2″ thick weighing almost 100 kgs excavated from Devsara. As the name suggests it shows various Avatars of Vishnu. Devsara, which is in Kulgam district had been in the past a great center for the casting of Bronze images and other metal works. Many of the bronze/ metal sculptures found here have unfortunately gone missing as they were simply taken away in the olden times as metal was always in high demand. This masterpiece was discovered in 1931 and it is dated to the period of Shankar Varman. Each of the deity cast on it has great detailing and as such is a brilliant example of Kashmiri metal craftsmanship of that period. Fortunately this great piece of art along with another bronze sculpture of Lord Buddha along with a few coins made it to the Museum from the Devsara site. This sculpture is one of its kind in Kashmir and maybe India as well and is rated one of the most significant archaeological find in the Indian subcontinent. Another fascinating item on display are the Stone sculptures of the Ghoda Galli. Dotted along the Pir Panjals at certain Passes are these stone sculptures of Man Riding a Horse. These are usually found at the top of some Passes and they are found at numerous locations all over the Pir Panjals in the Jammu region. No one seems to be sure of how many of these are spread all over the Region, Even the origin is not very clear. As I spoke to one of the officials in the Museum the sculptures show a distinct Hellenic influence. A significant site for these is a place called the Ghoda Galli situated near Ramban where a great collection of these sculptures exist. 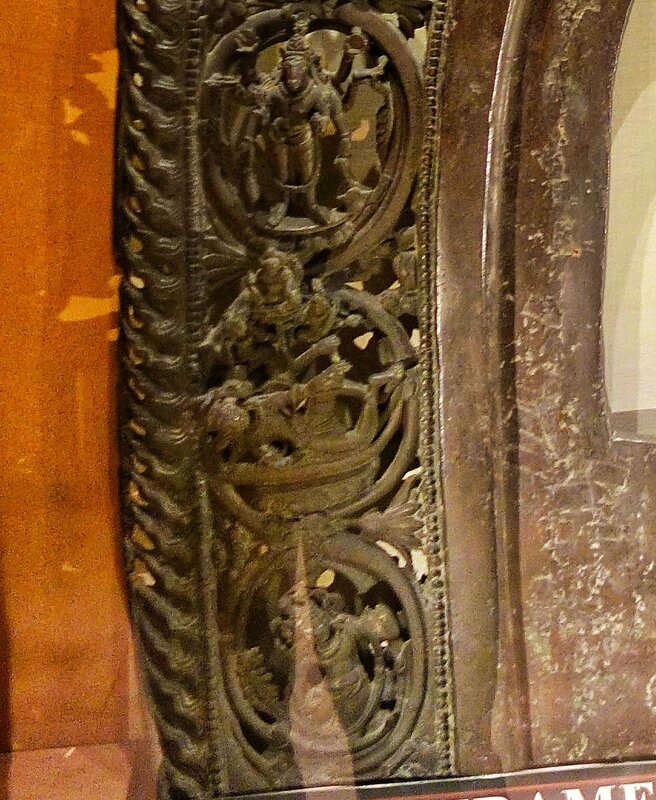 A few of these pieces were sent over to the Sri Pratap Museum as well. It would be one of the most expensive pieces of textile ever made if it would be put on an auction. In the Museum Parking lies an interesting exhibit probably the largest one in whole Museum. A boat that was gifted by Queen Victoria to the then Maharaja of Kashmir, Maharaja Ranbir Singh. As of today it lies in a bad shape as it lies out in the open. Hopefully more would be done to preserve this important piece of History.